I just wanted to say thank you to everyone who has left us such great reviews in the App Store! It makes a huge difference to whether we show up in search results, so we really appreciate it. Our mission is to bring you the best blogging app for your iPad, so it’s great to hear so many of you love it. If you’d like to share your love for BlogPad Pro you can leave an App Store review here, or if you have any questions or feedback please get in touch, we’d love to hear from you – we’ve seen how much you appreciate great customer service, so we’re always here to help! Thanks to all of you who have given us such amazing feedback! I have found this app to be simply amazing. Very well designed and very easy to use. The support team is also super quick to respond to any questions. I have nothing but positive things to say! I have tried several WordPress apps and this is by far the best! The developer has went to a great details to ensure that the layout of his app is as user friendly as possible. I can easily sit back with my iPad and carryout many functions on my WordPress from the comfort of my iPad. If I could rate this higher than 5 stars I would! I would recommend anyone who has a WordPress site to buy this app! Another thing that is important. The developer is always looking at features that can be added to his app. He is very quick to respond to any questions / queries that I had. This is something that I look at before buying an app. Keep up the good work on this app guys! I have tried numerous apps – even the WP free blogging app (which is horrendous, IMHO, and unstable – posts don’t always update/post with THAT app – not this one!,etc.) This app has it all: -ability to work offline -link to multple WP blogs (including my wordpress.com AND a self-hosted WP blog) -easily supports and links with camera photos/uploading is a snap -SUPERIOR SUPPORT STAFF (I cannot say this enough – really!) Not only have I purchased this app for my personal iPad at home, but I am working to use it (if WP will figure out how to let 165 high school students log in/out frequently in the course of one school day) with my class set of iPads (35). Students (even my very non-tech savvy kids) are finding this app *very* easy to navigate and learn from. (Their biggest hurdle is really just blogging lingo like “headline photo” (or something like that). It’s so easy to scale imported images, etc as well. Today my students were able to create their first blog posts and some of them struggle with email – let alone typing on an iPad – it was great fun to have them take pictures of each other, edit/crop off heads (keeping it safe, ya know…lol) and start their writing projects about clothing/etc in Spanish (foreign language classroom). There is SO MUCH to love about this app. I cannot more highly recommend an app and am looking forward to using it to blog more frequently myself when I can catch a breath from my high-learning curved high-tech classroom. While the price point might make your finger hesitate before clicking purchase, trust me when I say this: This app is worth more than any other app. The interface, the ease of use, the offline capabilities (traveling? no problem…crappy wifi connectivity? no worries! ), the SUPPORT staff and the seamless writing time. I don’t have to dink around with settings, I can just write. If you want to BLOG and you use WORDPRESS this is the App you are looking forward. You won’t regret it. Thank you for such great product. I’m looking forward to following your developments in the future. I have tried all the blogging apps including the official WordPress app but each one has had some flaw that made it less productive and efficient. This app supersedes them all with features and has none of the flaws. 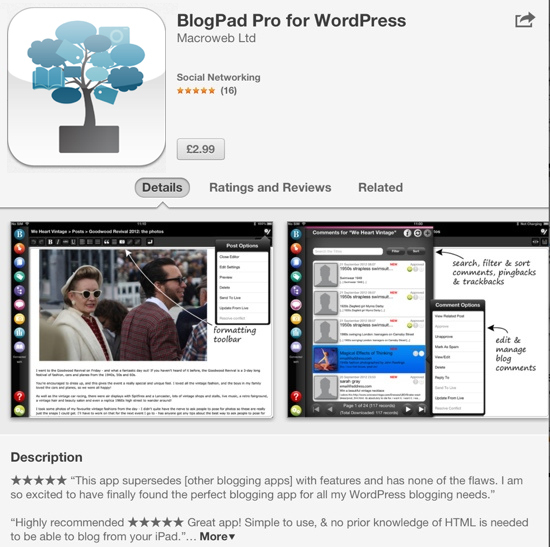 I am so excited to have finally found the perfect blogging app for all my WordPress blogging needs. The latest update and big fixes make this worth a rating update to a five. In fact its so good its the reason I decided to go with wordpress. Intuitive UI, lots of functions, by far the best blogging app I’ve used. If you have an ipad and a WP site – buy it. Since the latest update, this app has only improved! I’ve been putting it through its paces and haven’t had any issues. It works flawlessly and is the kick I needed to start blogging more. I love the look and feel of this app and had a few suggestions for additional functionality and bug fixes. The developer was friendly, quick to respond and open to my ideas. It is great to find a developer willing to incorporate feedback from their customers! I love the latest update! Really impressed with this app. Don’t even consider getting the WordPress app. All you need is BlogPad Pro, seriously! Really love it! When I first downloaded this app, it wouldn’t connect to my website (nothing to do with the app – faulty code on my site). I contacted support and I got a prompt reply, telling me that the error was on my site and giving me tips to find it. He even gave me the line of code which was breaking the site. After finding the code and deleting it, the app works amazingly. It connected quickly and downloaded all the files. The features are great and it really is worth buying. I haven’t found anything wrong with it at all. In conclusion, great app with amazing, friendly customer support. Just what everybody needs. I’ll definitely be using this from now on and recommend it to anyone. This entry was posted in News & Press Releases and tagged app, app store, apple, blog, blogging, BlogPad Pro, blogs, iPad, iPad app, wordpress.